See the potential labor savings you can realize with CADfix Plant and Process Simplification (PPS). For a limited time, try CADfix PPS software at no cost. Simply complete the registration form and our technical expert will answer your questions and get you started. CADfix PPS addresses key problem areas such as plant layouts, stairways, platforms, assemblies, equipment models, and skids. 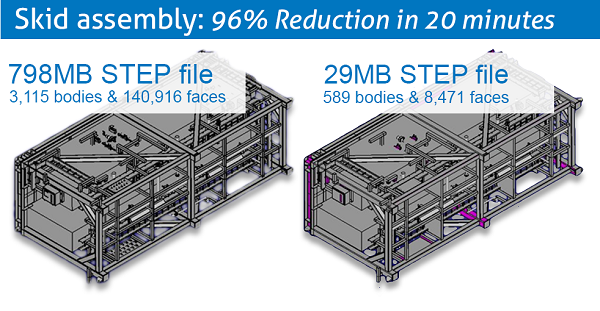 The CAD simplification solution reduces or removes unwanted geometry, CAD features, invisible or internal parts, and complex parts. Engineers tasked with process and plant design can achieve orders of magnitude in file size reduction and simplification ahead of integration into 3D plant and process design systems. Users of Autodesk, Aveva, Bentley, CADISON and Intergraph process engineering technology will learn how to save days of non-productive geometry handling, increase efficiency, decrease time-to-market and get to commissioning faster with the automated CAD model simplification processes available in CADfix PPS. Complete the form to get started today!